Disney, I grew up on your brand. Disneyland was where I went when I was a baby and I was born in 1953, the year it opened. I have such great memories of those days—the Disney channel, the cartoons, the characters, all so innocent and wholesome. Walt Disney and his company were all about family values and entertainment for the young, the old and the young at heart. My grandfather was a peer to Roy Rogers and Gene Autry as a country singer and actor in the ’40s and I even got to meet Walt when I was a child. My grandfather knew I loved Disneyland and took me with him to a function where he introduced me to Walt. I remember two things about him: one was that he was really tall (as I was about 6 years old at the time) and the other was that he was the kindest man I had ever met. So what happened? How did it all come to this? How is it possible the existing management of Mr. Disney’s legacy has allowed A&E to air shows like Leah Remini’s slander-fest as well as Elizabeth Vargas’s “show.” Is it reality TV? I think so. Its certainly not a documentary because it surely isn’t factual at all. I have been a Scientologist for 41 years and happen to know a lot about the subject of “Scientology and the Church’s practices” and know some of the people Remini has had on her show. One of them worked for me for several years and we never had any issues with her. Treated her like a daughter. Then, months after she abruptly quit with no real reason given, there she was spewing lies on Remini’s Show. WOW. Amazing what people will do for cash. I know the truth and it is not what Remini and Rinder are spewing at all. Not even close. But that’s not even the point. The point is that people’s lives are being put at risk due to the hate-mongering Remini and Rinder have displayed on your show. Three people to date—“kids” who, I’m sure, grew up on Disney—were “inspired” (so they told the authorities after their arrests) by your show’s host to perform hate crimes against my church. I say “your show” because it IS your show. You hired and went into agreement with Rinder and Remini when you decided to air this trash, therefore it is your show as far as I am concerned. The fact is that, in any venue, bigotry and hate will inevitably put lives at risk. And for what? Sensationalism? Ratings? Money? We find ourselves surrounded today by hate in the media. Its use of inflammatory language has exacerbated the differences between us. It is this language of hate that makes society unsafe for our children. Walt Disney Company was—and should continue to be—a counterpoint to this divisiveness. While the First Amendment to the Constitution protects even the likes of Remini and Rinder, it also vows to protect the religious rights of the American people no matter what their religion. I also bring your attention to the fact that Remini slams and holds up certain religions to ridicule with falsehoods and hate speech from former disaffected “members” (but were they ever even members, really?). These “former members” are being presented as people “in the know” about what “really happens” behind the scenes. Pure lies and B.S. 100%. Again, I know. But regular people don’t know. And so can be misled. Reality TV is entertaining when one can see it as the ridiculous comic fodder it is. However, when its purpose is the attack and ridicule of religions and religious beliefs as well as parishioners and staff of a religion, then the results are frankly showing the lack of foresight and idiocy of the production companies. Or is it actually their intention to produce such results? It’s hard to fathom, but maybe that’s the reality. The fact is that, in any venue, bigotry and hate will inevitably put lives at risk. And for what? Sensationalism? Ratings? Money? I am sure each and every individual at A&E, Disney and the production companies involved would shake in their boots if their chosen beliefs were so attacked and slandered and would find themselves going quite cautiously through life, fearing for their lives and the lives of their children. It is the responsibility of everyone and every company to think through the consequences of their acts and avoid acts that could harm or cost lives. I ask that Disney re-evaluate and cancel forever these two shows and any like them. No good has—nor ever will—come of them. Just let them go. And get CREATIVE and replace them with programming you would not mind your own family watching. No one should ever be put in harm’s way because of their faith. 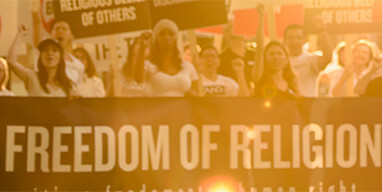 It undermines our nation’s fundamental commitment to ensure and protect religious freedom. I know Walt wouldn’t approve. Serial entrepreneur. Business owner and occasional blogger.